Another royal wedding! Lady Charlotte Wellesley of the U.K. stunned in a voluminous white wedding dress that took guests&apos; — including Duchess of Cornwall, Camilla Parker Bowles&apos; — breath away. The descendent of both Queen Victoria (on her mother&apos;s side) and the Duke of Wellington (who defeated Napoleon at the Battle of Waterloo in 1815, on her father&apos;s side) married financier and philanthropist Alejandro Santo Domingo on Saturday, May 28, in Illora, Spain. 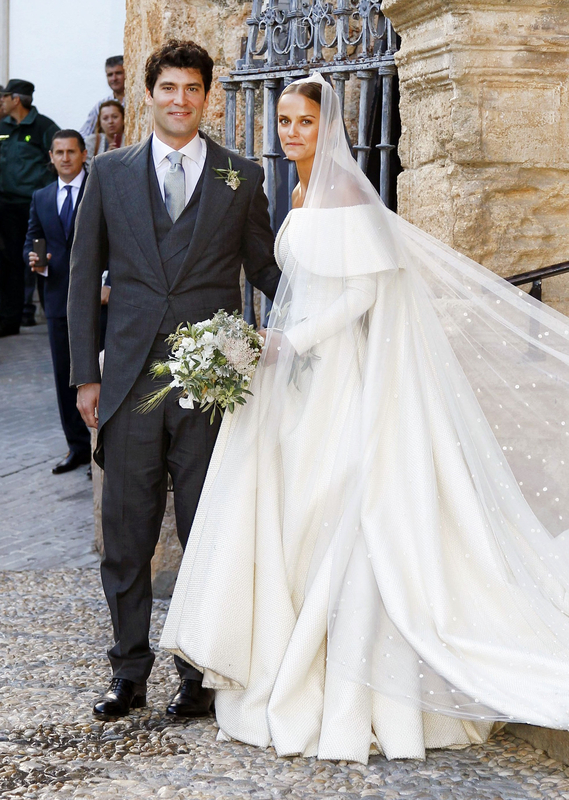 For the celebration, which was also attended by Spain&apos;s former king Juan Carlos I and singer James Blunt (who is married to the bride&apos;s cousin Sofia Wellesley), the bride wore an off-the-shoulder Emilia Wickstead gown with a flowing cathedral veil in a Swiss dot pattern. The dress featured long sleeves and a full skirt. Balancing out the bold silhouette of the ensemble, Wellesley wore her hair slicked back, parted in the middle and coiled into an elegant chignon that rested at the nape of her neck. According to Vogue, the couple exchanged vows in a Catholic ceremony ahead of a reception that included 200 guests at the Duke of Wellington&apos;s Spanish estate. What do you think of Lady Charlotte&apos;s wedding dress?